If you like to keep things looking original on your Nuffield tractor Implement then you will be interested in these badges. 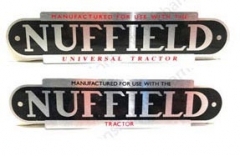 When Nuffield tractors took off in the early 1950’s the Nuffield organisation marketed “approved” machines and implements and they would have a badge riveted to the machine printed with “MANUFACTURED FOR USE WITH THE NUFFIELD UNIVERSAL TRACTOR”. This continued until May 1954. From 1954 onwards Nuffield Tractors were fitted with the BMC diesel engine and more and more implements were becoming PTO driven. A.R.M. Ltd (Agricultural Requisitions and Mechanisation Ltd) introduced the first Pick-up Hitch in the UK for Nuffield tractors and it was fitted as an option to Nuffield 342, Nuffield 460, Nuffield 10/42 and Nuffield10/60 tractors. A badge printed with "MANUFACTURED FOR USE WITH THE NUFFIELD TRACTOR" was riveted on to the Drop Arm and also on to the“approved” implements and machines. Ransomes Sims & Jefferies Ltd, McConnel Ltd, Fisher Humphries & Co Ltd, Philip Pierce & Co Ltd, Patrick & Wilkinson Ltd, Rotary Hoes Ltd, Midland Industries Ltd, H. Leverton & Co Ltd, M.B. Wild & Co Ltd, Humberside Agricultural Products, Taskers of Andover Ltd, E.V. Twose Ltd of Tiverton, Aldersley Engineering Co Ltd, Scottish Aviation Ltd, Tamkin Bros & Co Ltd, Goodcars Ltd, Skyhi Ltd, T. Baker & Sons.